The 2017 Honda HR-V LX is the most affordable model of Honda’s advanced crossover SUV, and it’s available right now at Brilliance Honda of Crystal Lake. As the most accessible trim in the HR-V lineup, it promises big value and big versatility, so it’s the perfect choice for many drivers in and around Elgin, IL. 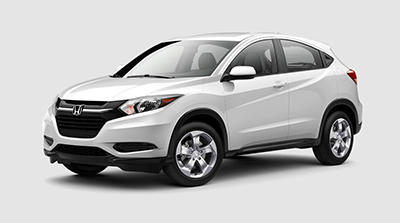 Find out more about the base model HR-V here at Brilliance Honda of Crystal Lake! The Honda HR-V comes standard with front wheel drive and a four-cylinder 1.8L engine that cranks out 141 hp. It’s offered with both a six-speed manual transmission and a continuously variable transmission. With CVT and front-wheel drive, the HR-V nets an EPA estimated 28 mpg city/34 mpg highway in EPA estimates, while the all-wheel drive equipped version with CVT is estimated at 27 mpg city/31 mpg highway based on EPA estimates*. One of the signature features of the Honda HR-V is its split folding rear Magic Seat. It folds flat to allow for up to 58.8 cubic feet of cargo to fit behind the front seats in the front-wheel drive model. With all seats in place, the front-wheel drive HR-V will carry up to 24.3 cubic feet of luggage. The Honda HR-V LX comes standard with important safety features such as a rearview camera, anti-lock brakes, stability and traction control, and more. Plus, the Honda HR-V has received the best possible 5-Star overall crash test safety rating from the NHTSA*. Test Drive the HR-V Today! The 2017 Honda HR-V is ready for you to test-drive here at Brilliance Honda of Crystal Lake. Visit us at 680 W. Terra Cotta Ave. In Crystal Lake, IL, just a short drive from Elgin, to get behind the wheel of this versatile small crossover now.